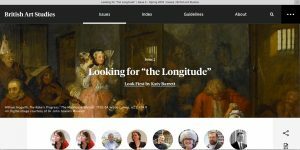 This entry was posted in Digital Humanities and 18th-Century Studies, Science and the Arts in the Long 18th Century and tagged digital humanities, Hogarth, London, longitude, navigation, sea travel. Bookmark the permalink. Dr. Katy Barrett is a Curator at Royal Museums Greenwich. She specializes in eighteenth-century art and visual cultures of science. Her longitude research was done as part of an AHRC-funded project co-hosted by the University of Cambridge and the National Maritime Museum, entitled "The Board of Longitude 1714-1828: Science, Innovation and Empire in the Georgian World," which also produced a JISC-funded digitization project with Cambridge University Library and a blog.